Description: Adobe Captivate creates interactive presentations for learning purposes. It’s commonly used to create eLearning modules. This is a video portfolio that demonstrates my work and experience. I recorded my projects with narration in Adobe Captivate, edited the audio, and added fades, text captions, and text animation. Another project I created with Captivate is this software demonstration that shows users how to log on to a learning management system. I created an instructional design document to determine the learning objectives and then made a storyboard of the scenes to prepare for recording the presentation. I recorded and edited the demo in Adobe Captivate, adding zooming, highlights, text captions and mouse clicks. This article was published by EdTech Magazine on August 27, 2013. Technology has made it easy for students to use their computers and mobile devices to continue learning outside of traditional classrooms. The ability to take notes electronically during class results in the conservation of valuable study time. In addition, many students find they are able to use digital notes more effectively than handwritten notes by conducting keyword searches to locate specific information quickly. Today’s college students are also able to annotate and share notes with study-group participants by using cloud-based tools such as Evernote and Google Drive. Undergraduates at Ithaca College in New York use Google Drive to create, edit, and share course outlines. These powerful tools enhance collaboration by allowing students to access their notes from any device, add comments and track changes. Google Drive and Evernote are also ideal for collaboration on group projects. MBA students at Stevens Institute of Technology in Hoboken, N.J., use Google Drive to collaborate on projects and presentations. The students can contribute to the same document without compiling or emailing different versions back and forth. For students concerned about equal contribution of work on a project, Google Drive shows revision updates made by each contributor. For research, students are using free tools such as Wikipedia, Twitter and Facebook. While Wikipedia is typically not allowed as an official source, it is frequently used to find other resources, since the site tracks footnotes and bibliographies. Students can look up a topic using Wikipedia and then refer to an article’s cited works for additional source material. Social media sites, such as Twitter, Facebook and LinkedIn, are used to poll communities and connect with experts. Social media is used to share ideas, articles and other resources. These networks are also used to hold relevant and meaningful conversations across time and geography. Ithaca College’s course on professional development uses social media to host guest speakers who are unable to travel to campus. Instead, the guest speakers are asked to check the course’s Facebook and Twitter pages during a given week and then respond to students’ questions. These tools are beneficial because discussion can be continued outside of class, thereby opening up a broader learning environment. Students are also using web-based conferencing tools, such as Google Hangouts, to interview experts about their work. Students in the Master of Arts in Learning Technologies program at Pepperdine University in California collaborate synchronously, or in real time, using Google Hangouts and Google Documents. The students are able to share their dissertation research and provide valuable feedback to one another in real time. Some students, such as those attending Pepperdine University School of Law, are even using this technology to interview for jobs or to work remotely while in school. Web-based conferencing is also a key tool used by students to hold team meetings for group projects. Stevens Institute of Technology management students also use web-based conferencing to present their final projects online and in real time to their instructor and peers. Today’s learners are actively seeking content and tutorials on topics of interest. Students and non-student learners alike access valuable online content from Khan Academy, TED, YouTube and blogs; they watch and read tutorials created by others; and they learn how to complete specific tasks, such as computing mathematical equations, writing computer-programming languages or using a feature in a software application, all without the guidance of an instructor. Technology enables learning to take place outside of the classroom and the library. Students use technology to meet, collaborate and create content virtually. In many cases, technology helps students research subjects, share ideas and learn specific skills. Technology also helps students make valuable networking connections with others in their field of study. An abridged version of this article was published by EdTech Magazine on July 25, 2013. It’s common for students to bring laptops, tablets, and smart phones to class. But what happens when they’re turned on? From the viewpoint of the lectern, it’s hard to tell if students are using their mobile electronics for educational goals or browsing the Internet. And are their actions distracting their peers? As a Manager of Instructional Technology, I’ve had the opportunity to observe several lecture hall courses ranging from 40-100 students. Sitting in the back of the classroom gave me a great view of the students’ computer screens. I was pleasantly surprised to find in a class of 100 students only one student was on a Web page other than the course Learning Management System, the downloaded lecture notes, or a Word Document. Pretty impressive. These observations support the hypothesis that students are using computers in the classroom to aid in their instruction. How does it aid in their instruction? Professional students use the opportunity to make additions and annotations to downloaded class lecture slides or transcribe the lecture using word processing programs. “hiding” behind their computer screens. They’ll shut the computer screens and contribute worthy discussions if the lesson is dynamic. Alternatively, technology can be used as a teaching advantage. Students who are introverted may find it easier to participate in class if they can do so via technology. 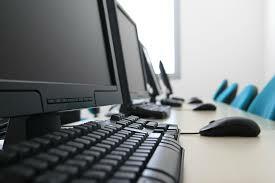 Incorporate tools such as polling technology and back-channel blogs to have students participate with the computers they are already using. These tools can allow for anonymous participation and contribution to the class without students’ feeling cornered or in the spotlight. Ideas can be free flowing with the disinhibition associated with anonymous contributions. Conducting lessons with anonymous participation means we need to rethink traditional participation grades. In addition, using these online technologies to encourage participation can be beneficial in interacting with all students, not just the select few that raise their hands and speak up in the limited class time. Every student can contribute by answering polling questions and typing their responses into a class website. These tools can also be beneficial because the class discussion can be continued outside of class, thus opening up a broader learning environment. It’s not just about how students are using computers in the classroom, but how the use of computers during class impact students outside of class. Students prefer to take notes electronically so that they don’t waste valuable study time transcribing hand-written notebooks to a digital notebook. Digital notes results in better use of students’ study time. Students are able to do keyword searches for documents and topics to locate specific information quickly, collaborate and share notes with their study groups, and prepare written work quicker by copy and pasting direct quotes from their pre-typed notes. Students are going to use laptops and mobile devices in the classroom. Embrace the technology and work with your Educational Technologist or Instructional Designer to determine the best tools and methodologies to enhance your course with technology and support the course objectives. For more information, view my Portfolio and Resume. I wouldn’t be an Instructional Designer if I didn’t have an urge to share with you how I created this final video! I scripted and used storyboards to determine what I wanted to say and what corresponding assets/ images would be included. I kept in mind that my audience of busy professionals and instructional designers would only have an attention span of 2-4 minutes. After the design phase was complete, I filmed the “talking head” portions using my iPhone (iOS6), an Olloclip iPhone Camera Lens, and the App FiLMiC Pro. I was also lit. Once I gathered footage and B-roll, Adobe Premiere Pro was used to edit the final video. To share it with the world, I added the final video to my YouTube page, posted publicly but disabling comments. I used the Embed option under the Share feature to insert the video source into my Web site. And Voila! There we have it! Since I’m building my Portfolio and a Video Portfolio, I thought I would include my Resume as well! PDF Version of Resume. Presented “Engaging Faculty in the Use of Technology Without Using the ‘T’ Word” (2013) at the CALI Conference for Law School Computing.Presented “Help! My Students are 3,000 miles Away! Using Social Media to Interact with Online Students” (2013) at EduSoCal Conference for Information and Educational Technology. Presented “WebCampus Course Quality Audits: Providing Feedback and Gathering Best Practices Data” (2010) at the Sloan-C International Conference on Online Learning. Being an Instructional Designer. (2012). Designing Effective Instruction (7th Edition) by Gary R. Morrison. Wiley, John & Sons, Inc. Effects of Interactive Multimedia in eLearning on Learners and Developers. (2008). Papers from the 5th Annual Conference for Undergraduate Research in Communication. Rochester Institute of Technology. Founded EdTech Meetup LA (August 2013- Present). A regularly occurring face-to-face and online gathering for local Educational Technologists and Instructional Designers to meet and discuss trends in the industry. Description: Web conferencing tools are an Internet software that participants use to communicate with one another over Voice Over IP (VoIP) or dial-in services. Many Web conferencing services offer features such as a digital whiteboard, screen sharing, private chat and breakout rooms to make the conversation more than just a phone call. In addition, there are options to record the Web conferencing session, which is beneficial for those who miss a scheduled meeting or would like to review the content. Web conferencing services are beneficial in many different sectors, including corporate training and development departments, higher education, and education. The system can be used to conduct conference calls with remote employees, host virtual webinars at conferences, or conduct a synchronous class or training lesson. Application/Example: I have trained Professors and students on how to effectively use Wimba as a meeting space for online classes. My work includes best practices such as muting microphones, engaging student participants with polls and questions, annotating PowerPoint slides to direct students’ attention to the content, and breaking an hour long session into 15-20 minute segments. In my Wimba training course, I used examples of each of the Web conferencing features so that professors would see exactly what the features look like in the context of the online environment. I conducted training of these tools in two different segments- the first in which the professor takes on the role as the Moderator so they can learn to effectively use the tools. 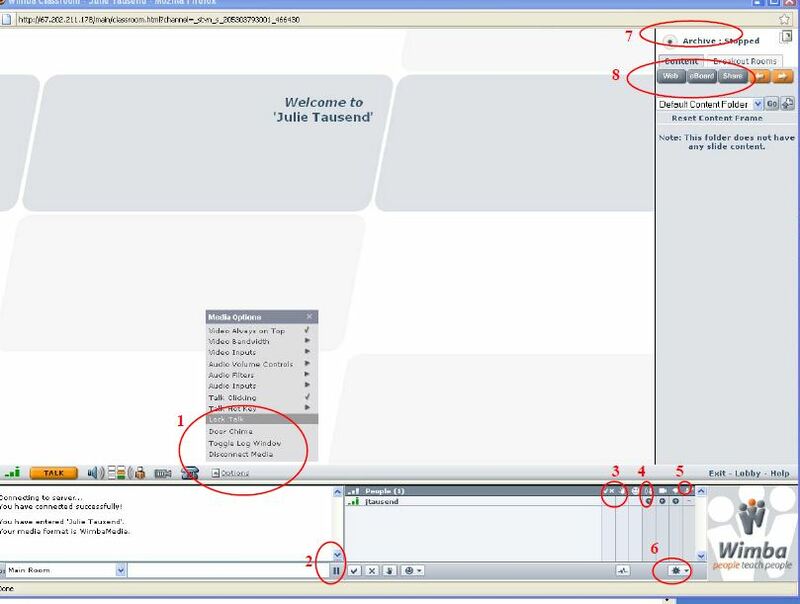 The second segment allows the professor to enter the Web conferencing system as a participant, which has limited access to the admin tools. In this role, the professor experiences the Web conferencing tool from the viewpoint of the student and thus, is able to better design their own synchronous online lessons. I also created visual User Interface quick guide for Professors to have as a reference when they are hosting a live session. Description: LMS are Web based software that is used to deliver online education and training programs. LMS can be beneficial in many different sectors, including corporate training and development departments, higher education, and education. The system is used for the administration, documentation, and reporting of eLearning. Typical features include resources, web links, discussion boards, and assessment tools. Training and online courses can be designed for instructor-led or self-paced study. Users (students or employees) securely log into the LMS to retrieve resources such as documents and videos. They can then be assessed based on quizzes and tests; the tool also allow for the submission of written work. Communication tools include discussion forums, email, and messages (instant messaging). Application/Example: I designed a Moodle course to train faculty members in using Moodle to instruct their own online courses. Faculty specializes in Management, Engineering, and the Sciences. In my Moodle training course, I used examples of each of the Moodle features so that professors would see exactly what the features look like in the context of the online environment. I also created assignments, quizzes, and discussion forums so that the professors could experience these features from the viewpoint of the student and thus, be able to better design their own courses. After discussing with the Director of Project Holodeck, Nathan Burba (@NathanBurba), his goal of completing one new programming tutorial a day, I decided to create a similar learning goal. With the Technology Challenge. I believe this is a good challenge for me because I have only finished my MBA Degree for under a month and I am already getting antsy about what to do with my free time. Don’t get me wrong, I am gainfully and happily employed. But I love learning! And I feel a piece of me missing when I don’t have a new challenge or project. With that said, by posting this Technology Challenge on my blog, I am making myself accountable for pursuing the stated goals—I don’t want to let you down! I also realized that my resume may be good, but my portfolio could better showcase my Instructional Design skills and adeptness of exploring new Educational Technologies. Enter the Technology Challenge! The tools (in no particular order, and will be added to)? Feel free to leave suggestions for tools I should challenge here as a comment or Tweet @julietausend! It’s a special treat for my regular followers, you’re hearing from me twice this week! A follow-up post on the Keynote Address by Michael Wesch has been written. Wesch is a cultural anthropologist exploring the effects of new media on society and culture and his speech gave some valuable insight on Transformative Learning Theory and new media. What do you do when you teach an online class 3,000 miles away from your students? Many would say, use Web conferencing to hold synchronous or live class sessions. I would typically whole heartedly agree. However, not only am I teaching students located in Ithaca, New York while I am in Los Angeles, I am also working a full-time day job with at least a 90 minute commute. This means the earliest I’d be able to meet online would be 8 pm PST or 11 pm EST for my undergraduate students. In addition, five of my students are studying abroad in London. Therefore, unless I want to torture my students late at night or during the weekend, synchronous Web conferencing sessions are just not possible. So, again, I ask, what does an instructor do when they teach students who are in different time zones? My solution was simple. I created a “Video Syllabus” to introduce the course, the course environment, and my expectations in regards to requirements. I used lecture capture software that allowed me to record both my Web cam and my desktop, along with audio, at one time. I navigated to the online course environment to show exactly where the students needed to go to obtain relevant course materials. As I moved my cursor, the lecture capture system recorded the moves. This makes it easier for students to visualize where they need to go, as opposed to reading text directions. In addition, having my Web camera record me as I spoke, allowed for a better interpersonal connection. Students liked that they were able to see me and put my face and voice together with the person who was lecturing and responding to Discussion forums. It shows that there’s an actual instructor involved in the course and not a random group of people hired as graders. I saw a decreased number of emails asking for clarification on requirements compared to semesters when I did not us the video syllabus. Another hurdle I’ve faced is “how do I get my students excited in the content, when I’m 3,000 miles away?” This is an obstacle that many online instructors have to overcome. Since this course is only a one-credit course and my students are undergraduates, I decided to take advantage of the interests of the millennial generation by using Twitter and Facebook. The class is designed based on discussion relating to topics of: Career planning, Professional Culture, Networking, Work Life, Professional Development, and Work Place Professionalism. The Facebook Group is SEPARATE (as in I don’t friend my students) and PRIVATE (as in only those on the course roster are invited). Participation this term was optional. I had 90% of my students use Facebook, and of those, 100% were active. Twitter had a 75% user rate, with 80% of those users being active. The Facebook and Twitter accounts also have varying levels of interaction from the Passive class announcements and reminders, to supplemental materials to be read, to the more interactive extra credit assignments, and the highly interactive Guest Speakers. To engage my students, I created a Facebook Group and Twitter Feed and arranged for “Guest Speakers” to join us in our social networks for specific topics. The Guest Speakers have the flexibility to respond anytime during the week, which makes commitment from our guests much easier than having to travel to campus. Students are required to participate in the Guest Speaker sessions by posting questions to the guests on the designated topic. The students read short biographies of our guests and have asked questions that result in the reflection of our guests’ career and education experiences. Most of our guests are Ithaca College Alumni, so there’s already a bond created and a frame of reference for the discussion. Since the discussion posts have been lengthy, our guest speakers have preferred to use Facebook as the communication medium. Therefore, I’ve found other uses for our Twitter feed. Class announcements, such as due dates, are a basic use of the tool. However, students have been using the Twitter feed for Extra Credit. For example, students were asked to attend a Job/Intern Fair and collect a minimum of three business cards. To earn the extra credit, they needed to tweet a photo of each business card and state what the company was seeking in an employee. Not only did the photos prove they attended (since I’m off campus and cannot provide an attendance sheet), but the tweets also alerted their classmates of the opportunities available. Next term, I’d like to utilize Twitter for concise and dynamic discussion, but I need to work on aligning pedagogy with the tool in order to accomplish the goal. I saw a pattern in the discussion, with 75% of questions occurring the first three days of the lesson, 5% occurring mid-week, and 20% of the questions occurring the last day. The fact that students participated from an early start makes me believe that they were excited about how the Guest Speaker sessions are conducted. The big question is- How are you using Social Media and New Media? Comment below!